Dendritic growth that forms a complete ring, with poorly defined, but clearly distinguishable, crystal faces and with small hollows on the surface. 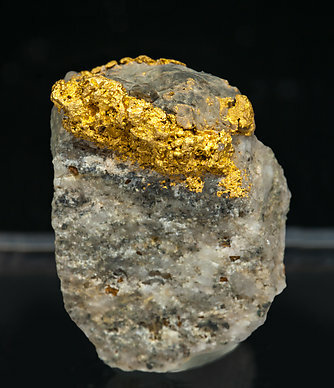 Gold pebble that on one of its sides partially preserves some of the well-defined original crystalline forms and includes small Quartz granules. The sample is from an ancient locality in the Dominican Republic that is considered as historic. We’ll send to the buyer the original label and also a copy of the computer card with the full collection catalog text. 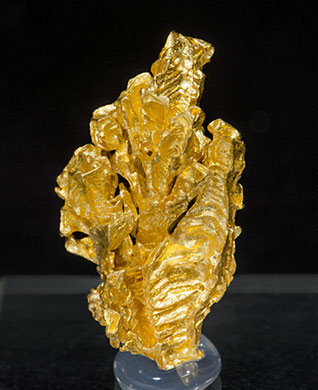 Very bright spongy growths and laminar crystals of native gold on a Quartz matrix. 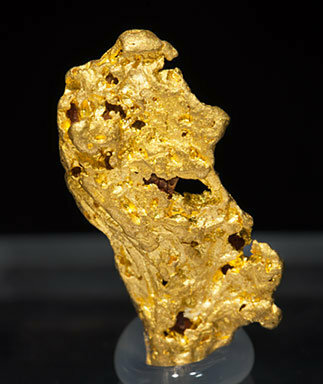 The sample is from a Colombian mining area not well known until now. 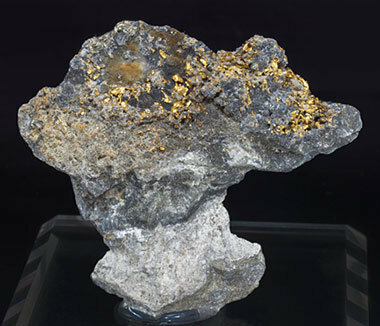 Irregular native Gold aggregate on a matrix of massive Quartz, with echeloned growths and poorly defined but visible crystalline surfaces. This specimen has an excellent quality-price ratio given the good definition of the terminal faces of the crystals that show a kind of "hopper" growing. 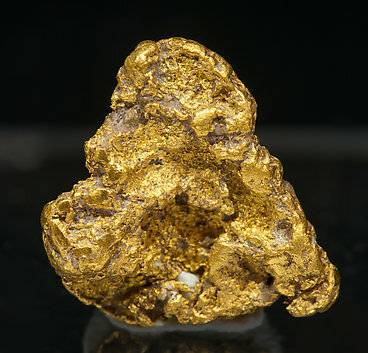 Flattened and elongated Gold nugget with small vugs, inclusions and hollows. The sample has a good size for the locality and shows on its upper part some defined but quite rounded crystalline forms. 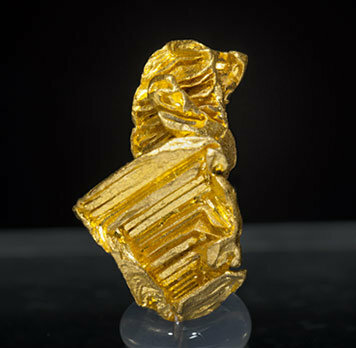 Floater specimen of octahedral crystals with very well defined spinel law twinning and deep skeletal growths. The site is currently not supplying new specimens for collectors so new finds are not expected. We analyzed these Golds and they are really special. 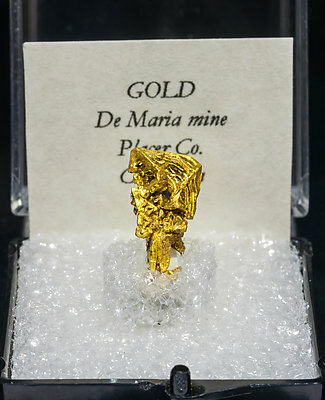 They contains a 99.1% Gold and about a 0.5 % Rhodium, which is quite uncommon. We’ll send a copy of the analysis to the buyer. A novelty at Tucson 2016. Floater and very aerial aggregate of flattened cubic crystals that have very well defined skeletal growths. According to our sources the site is not supplying new specimens for collectors so new finds are not expected. We analyzed these Golds and they are really special. 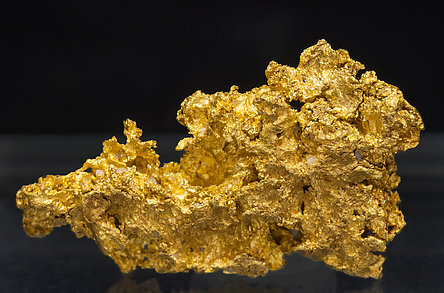 They contains a 99.1% Gold and about a 0.5 % Rhodium, which is quite uncommon. We’ll send a copy of the analysis to the buyer. We analyzed these Golds and they are really special. 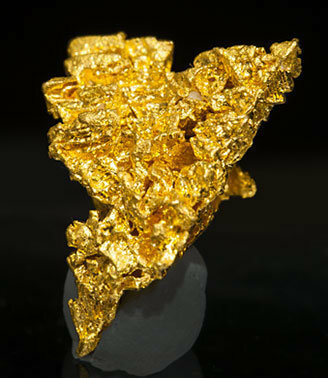 They contains a 99.1% Gold and about a 0.5 % Rhodium, which is quite uncommon. We’ll send a copy of the analysis to the buyer. Very aerial dendritic aggregate of very elongated octahedral crystals that have unusually well defined faces and edges. Dendritic, spongy and laminar Gold growths perched on a Quartz pebble. 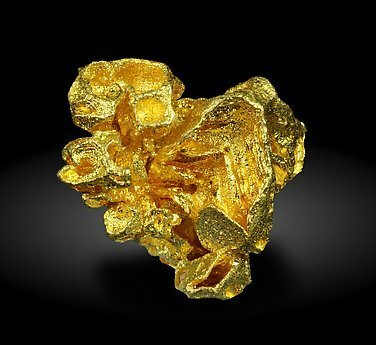 From an occasional and very recent find at a Spanish place in an area in which Gold pebbles have been noted, but is not well known until now. Dendritic growth of very bright laminar forms, on a small Quartz matrix. 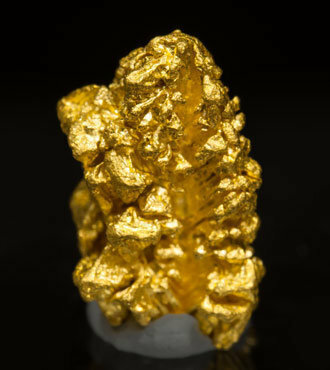 The sample is an excellent thumbnail from a locality that is practically unknown for collectible gold samples. 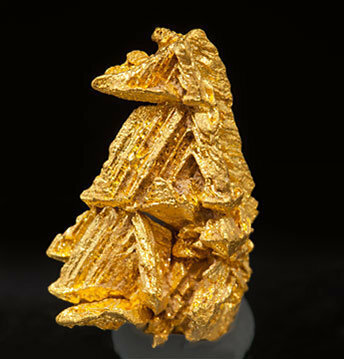 Skeletal crystals and leafy growths of native Gold. They are very bright and are on a rocky matrix. 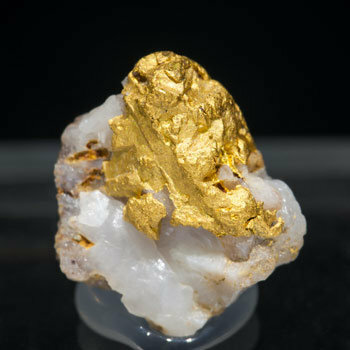 The sample is from a Colombian mining area not well known until now. A novelty at Tucson 2018. 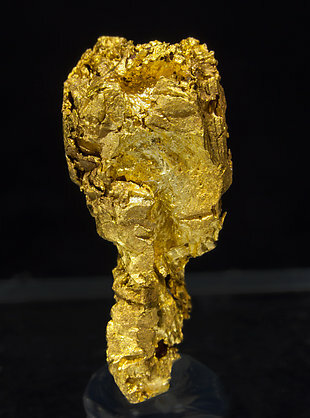 The sample is from a new place, not so far from the better known Serra do Caldeirão where the gold samples have different morphological characteristics. 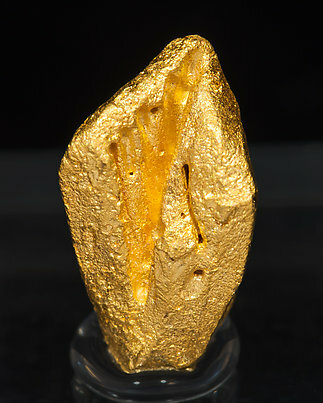 In this case this is a single floater and complete crystal with very well defined faces and edges and a Spinel law twin. 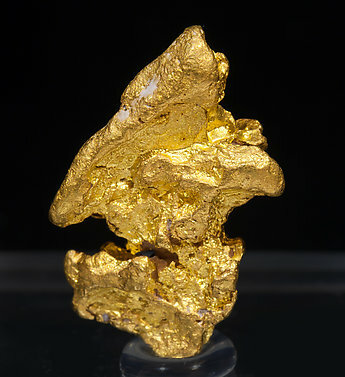 Complete Gold nugget preserving rough octahedral crystalline forms, with relatively well preserved faces and edges. Very aerial growth of very sharp octahedral crystals with deep hollows on octahedron faces and extraordinarily bright. A novelty at Tucson 2016. Floater and very aerial aggregate of flattened crystals that have very well defined skeletal growths. According to our sources the site is not supplying new specimens for collectors so new finds are not expected. We analyzed these Golds and they are really special. 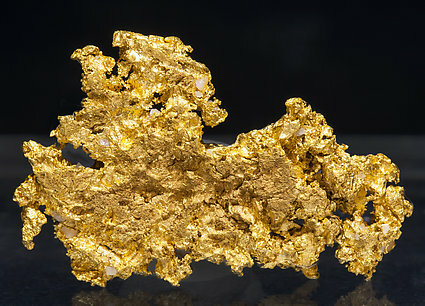 They contains a 99.1% Gold and about a 0.5 % Rhodium, which is quite uncommon. We’ll send a copy of the analysis to the buyer. 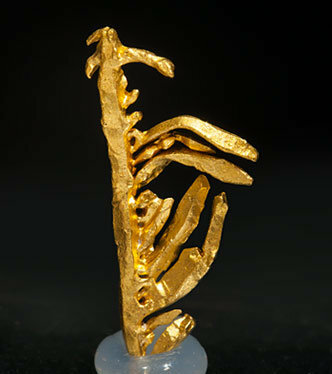 Skeletal and leafy growths of native gold on a rocky matrix with Quartz (chalcedony variety). 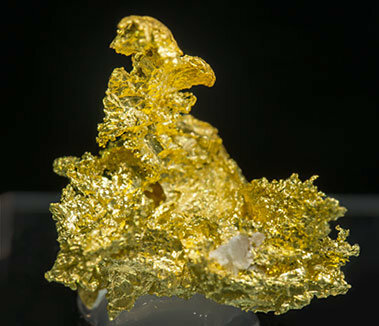 The sample is from a Colombian mining area not well known until now. Very aerial and bright aggregate with crystalline forms perhaps not so well defined but evident. 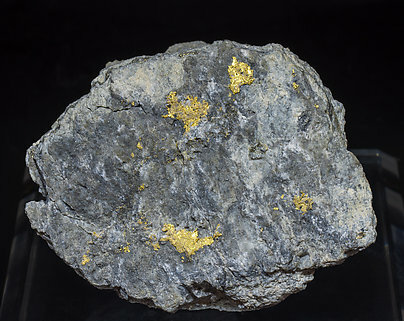 The sample is from a not yet quite well defined area in the Sidi-Ifni region. Floater that is bright and has poorly defined but existing crystalline forms. 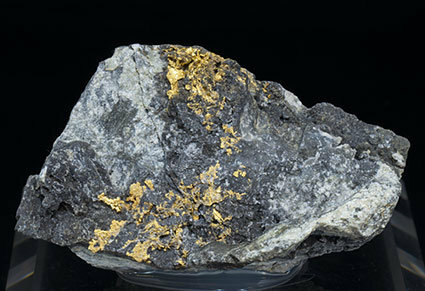 The sample is from a not yet quite well defined area in the Sidi-Ifni region. 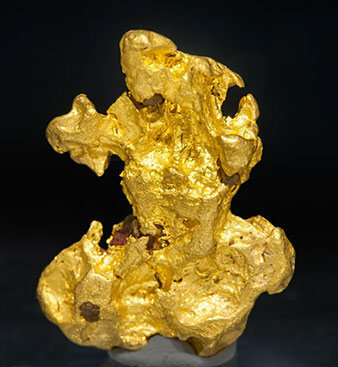 Group on matrix of native Gold cubic crystals, slightly deformed but with well-defined faces and edges. 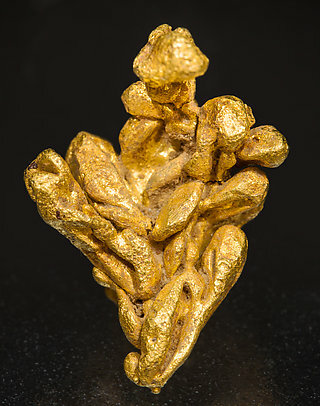 Very slightly eroded nugget of native Gold preserving some quite well defined crystalline forms that have a considerable size. 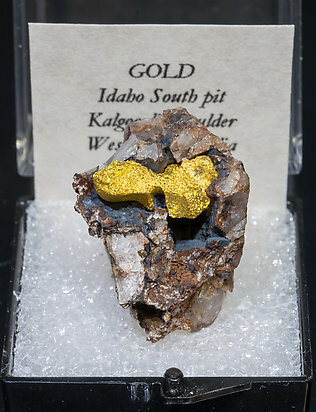 The sample is from well-known gold locality but where samples of this size are rare. A novelty at Tucson 2018. 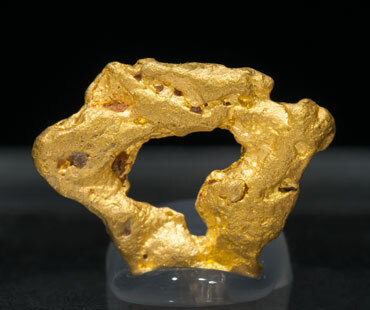 The sample is from a new place, not so far from the better known Serra do Caldeirão where the gold samples have different morphological characteristics. In this case this is a floater group of elongated crystals with slight curvatures on some of their faces and edges and a Spinel law twin.